IMPORTANT: MY OLD UPLOAD SERVICE WILL CEASE TO EXIST SOON. I WILL TRY TO REUPLOAD THE SCREENSHOTS AS SOON AS THIS HAPPENS. @Landman and S4real: Thanks you two! Quote: " The performance improvement is quite impressive with the mod implemented." Quote: "I haven't had a chance to check back here recently, but it's still just as cool as when I left it That new Spyran looks awesome! Thanks a lot! Glad you are still interested. Time for a larger update. I have built 2 somewhat decent testmaps to illustrate this update. These levels aren't completely done yet as designing the new higher quality visuals takes some time and implementing the more complex gameplay takes some nerves However! I do believe that they show some progress and I haven't shown any direct screenshots in quite some time. * Higher quality in both design and textures. * Improved introduction plot...with less textscrolls. To be honest, working on this game doesn't feel like making an FPSC game for quite some time now and I hope you are as fond of the results as I am so far. Activating these arcane glyphs allows the player to spawn hidden objects. From items to passages. The architecture of this room is still a little incomplete but this is close to what it will look like in the full version. Some of this specularity will also blend in better in the full version. I have added female necromancers to the lore. She does not have a proper shader yet which is why her stomach and hands look a little choppy. I can assure you that the final version will look a lot more lively. 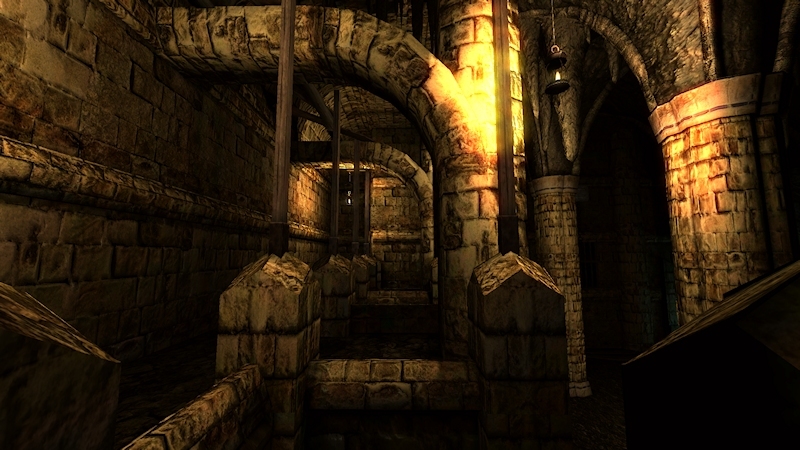 Dungeons will often vary in architecture and design. I want there to be caves bordering in architecture aswell as in - to outdoor segments. This hall should look like its "carved in" the rock. I'm still working on that but its an explanation as why there are stalactites hanging down from this ceiling. I find that the caves have a neat "wet" feeling to them. In case you haven't read it above. The playerbody can now be seen ingame in my prior post. It'd be kind of you to leave some comment or question It might take me a while until I can present another update. Those levels are incredibly and unbelievably non-FPSC-like! I can't wait to see this game finished! Those shots are downright gorgeous! The atmosphere is quite authentic and very pleasing to the eyes and the environment looks like it has a lot of stories to tell to the player. Now if the gameplay is done as masterfully as the aesthetics then you sir have crafted a MASTERPIECE! I know you have always been one of the better level designers, but, this new stuff is just out of this world! Quote: "Those levels are incredibly and unbelievably non-FPSC-like! " Quote: "Those shots are downright gorgeous! The atmosphere is quite authentic and very pleasing to the eyes and the environment looks like it has a lot of stories to tell to the player. " Quote: " Now if the gameplay is done as masterfully as the aesthetics then you sir have crafted a MASTERPIECE!" I'm really glad you like it this much and I do my best to have creative and non-repetitive gameplay in place. However, the gameplay feels a bit more like an FPSC game than the visuals...yet. thanks a lot! All thanks to s4real for permitting me to make larger, more detailed levels. I wasn't able to aim for something like this before without making my levels way too small. I know you probably get this a lot, but the amount of work you have put into the media of this game is really stunning. Quote: "I know you probably get this a lot, but the amount of work you have put into the media of this game is really stunning." Quote: "Some of these screenshots I thought were from UDK even"
It feels a lot like working in UDK, with all the things FPSC can do now! Thanks a lot! Here is a little update. First and foremost: The thread looks kinda messy at the moment. My old image hoster went down and I guess I have to reupload some shots and edit this...alternatively start a new thread. I talk to the mods about that once I get a chance. Statue and Windows will be available in my new fantasy pack...that will be announced soon. I don't know if it's my screen or what, but it seems a bit too dark. I've got a question, does all the entites displayed on the last screenies actually use a shader ? If it's the case I really wonder how you can manage to achieve that with FPSC because I have the feeling that it hurts my framerate, it's still playable since I run at ~170 FPS ( max 320 ), but still, I don't understand, how big are you maps, grid-wise ? Quote: "I don't know if it's my screen or what, but it seems a bit too dark." Odd! It displays fine for me. Its a little darker, I took this from an FPSC test level and not a build, for some reason these are always darker. Quote: "I've got a question, does all the entites displayed on the last screenies actually use a shader ?" Quote: "If it's the case I really wonder how you can manage to achieve that with FPSC because I have the feeling that it hurts my framerate, it's still playable since I run at ~170 FPS"
I run S4's Mod which improves FPSC's Performance a lot and gives me the little "extra" space needed to make some actual levels in FPSC. Still! These levels are pretty big, they use half the grid or more because I didn't want the player to stare at a loading screen every few minutes. That cave level is the largest one of the recent levels and it only works because almost every rock/cave element sources from/uses the exact same texture. Thats one of the tricks. Having elements use the same textures. The second one is compressing your .dds files to be as small as possible. .dds files in spyra are 4 (or more) times smaller in file size than they where in Psishock or Children of Dagon . 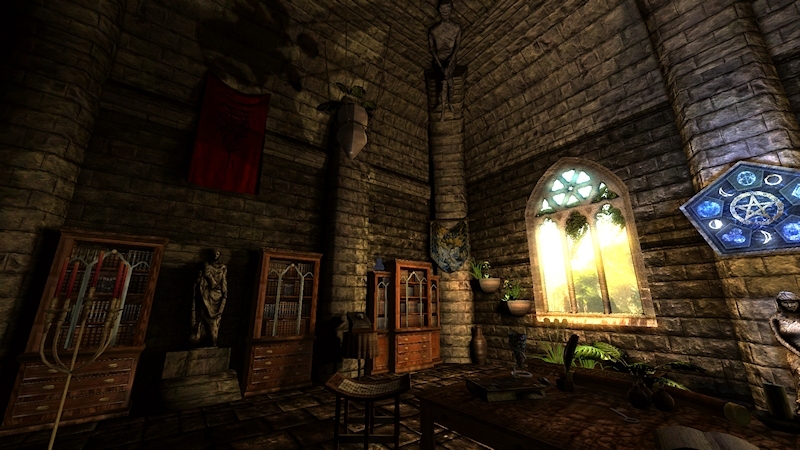 If you want to have a really detailed place/room its better to make this a separate setpiece or cutscene level than to have a very short gameplay level. If the player gets to do things, then interrupted by a loading screen while in the middle of things, he is much more likely to get frustrated than if there is a loading screen after an element that furthers the plot. Another thing: Not everything needs a normal map. Some things are just fine with a mild specular map or no shader at all. Quote: "Your framerate seems to be capped different than mine, you run any mod? However, its a good question. My framerate fluctuates between 56 and 60 (maximum 60). (occasional drop when a lot of chars are active...you know how it is)"
I'm using the v1.20 beta 15 since all the others seems very slow to me ( the fpscount displays ~75 but it's like my game was running at ~40, which isn't really acceptable imho ). Quote: "The second one is compressing your .dds files to be as small as possible. .dds files in spyra are 4 (or more) times smaller in file size than they where in Psishock or Children of Dagon"
For the size, I use 512x512 for most of the textures used by big items such segments, barrels or statues, my smallest texture size is about 16x16 and used for things such as color gradients or coloured specular/cube maps. Quote: "DXT1 and 5 may be lightweight, they totally destroy my textures by adding tons of compression artifacts on them." you may want to try a different program for .dds conversion. I use this and it's free last time I remembered. I think the issue is that the windows are glaring brightly but the room still seems a little dank. It looks awesome though! whats up? Is there some progress you can show? Woh, what's wrong with my sig? It's all.....gif-like...PhotoBucket, what are you doing? What's happened to Wolf?! I haven't seen anything from him in an absolute age! I fear we may have lost him to another engine! Quote: "I fear we may have lost him to another engine!" Quote: "What's happened to Wolf?! I haven't seen anything from him in an absolute age! I fear we may have lost him to another engine!" Well to be fair, almost everyone went bottom side up when the new Reloaded page launched. I guess the times of the original community are at a swift closing. Quote: "I guess the times of the original community are at a swift closing." Sad times! I checked on his blog and nothing has been posted for a while. If anyone would know, its Bugsy! it's been a while... Wolf isn't in game design anymore. He's focusing on art now. That's why he left the Canalyst team. Quote: "Wolf isn't in game design anymore." Well that is a shame then. I really wanted to see this game take life. I guess its his decision to or not to finish it however. Perhaps he is having more luck with his artwork. Quote: "Wolf isn't in game design anymore. He's focusing on art now." Shame At least he's good at art! Argh don't say that! I'll go all nostalgic! Crap, talk about a shocking news... so this is why he deleted nearly all of his FPSC videos from his Youtube account ? Maybe this is how things are supposed to be, I mean, "elders" ( if I may say ) are leaving, then the newcomers have to succeed them. "I like to keep this handy, for close encounters." Quote: "What's happened to Wolf?" it's been a while... Wolf isn't in game design anymore. " Yes its true! I actually started to write a humongous "good-bye" thread where I'd recap my projects, post a compilation of some of the best FPSC Projects that came along during its long runingtime (because whenever a user posts such a list its lacking a lot of projects, especially ones made outside of this community...and contain some that are very outdated and dont hold up anymore.) and share some community anecdotes. I also wanted to add a rant on how I thought that by now videogames would have finally reached a state where they are an interactive story-telling medium for all ages but ...that hasn't happened yet, has it? I decided against it seeing how the old community was dying down a little and I figured I'd just fade out, having the screenshots on page 4 of this thread as my final contribution as a videogame developer. You see, when I was a teenager and really into videogames, it was exploration and a sense of wonder that made games "magical". It enjoyed interactive 3D worlds and a certain artistic approach and attention to detail made these really come to live. Morrowind had that, a lot of fantasy games from the 2000 to 2005 aera. Modern games are often so overproduced, with the art department just producing assets, disconnected with the rest of the development that all the details and more are there, and it looks really awesome, but feels shallow and lifeless in many occasions. It really sticks out, comparing Splinter Cell: Blacklist to Chaos Theory or Morrowind to Oblivion. 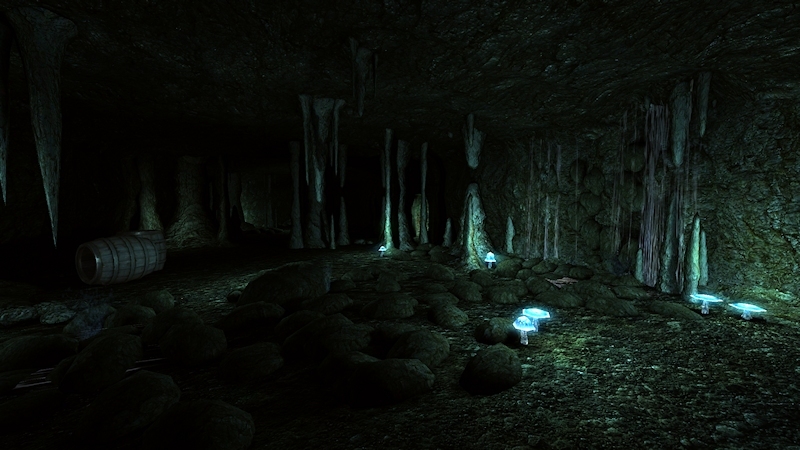 (Skyrim suffers it too but hides it a lot with way better aesthetics than you find in Oblivion.) Gothic I and II compared to latter installments. However, 3D worlds are no longer interesting and the modern gamer takes them as a given so essentially I'm still crafting "swords" where the general audience already uses "rifles". The golden age of shooters is also over. Remember when shooters had a nice "hot and filthy" manly B-movie flair? When you where shooting demons from hell and not minorities in a pseudo-warfare scenario? Yeah! These games still come out, and there where some great additions in the last few years but I feel that games in general take themselves too serious and are too dark nowadays. Don't get me wrong, horror-games should be dark. Games with a military conflict thematic should be dark... but we also need the fun stuff! Gothic I and II compared to latter installments. However, 3D worlds are no longer interesting and the modern gamer takes them as a given so essentially I'm still crafting "swords" where the general audience already uses "rifles". The golden age of shooters is also over. Remember when shooters had a nice "hot and filthy" manly B-movie flair? When you where shooting demons from hell and not minorities in a pseudo-warfare scenario? Yeah! These games still come out, and there where some great additions in the last few years but I feel that games in general take themselves too serious and are too dark nowadays. Don't get me wrong, horror-games should be dark. Games with a military conflict thematic should be dark... but we also need the fun stuff! However, something I announced long ago finally manifested itself: I'm done with videogames. I wanted spyra to be my epitaph in this and it certainly was the best compromise between ambition and something that I could actually achieve in FPSC but I'm simply done with it. I was into making videogames since late 2004 and bought FPSC in late 2005 (or very early 2006). During that time I grew from a child to an adult and making games as a creative outlet became part of my identity. However, over the last few months I was still working on Spyra I felt how it was less and less fun and compared to the other things I was working on a lot less rewarding or important. Since I study psychology which is a subject that requires me to do a lot of reading I do also lack the time to make any substantial progress in this kind of hobby. I'm not saying "farewell" because its possible that I will throw together a small game every now and then but this will certainly not happen this summer. Maybe once I reach one of these life-phases again where everything is more routine and I need some outlet for my "creative energy". Spyra and all my other projects still live on as a backup I can dig out if I ever feel like painting some polygons on a 3d canvas again. I did however delete all of my tools and software I gathered throughout the years (modeling etc.) but kept the really good ones as a backup aswell. Quote: "I fear we may have lost him to another engine! " No! That just doesn't work for me. Too time-consuming. Quote: "He's focusing on art now." While its true that I draw and paint, I can't say that I focus on it. It certainly doesn't take up the same focus and dedication Spyra did. Quote: "Shame At least he's good at art! Thank you! Thats very kind! Quote: "Argh don't say that! I'll go all nostalgic!" Quote: "Crap, talk about a shocking news... so this is why he deleted nearly all of his FPSC videos from his Youtube account ?" There will be a gaping hole without him. Yep, he will be missed. :/"
Quote: "Maybe this is how things are supposed to be, I mean, "elders" ( if I may say ) are leaving, then the newcomers have to succeed them. Goodbye! Sometimes life just...changes, doesn't it? Quote: "I'm 22 =D ...but yes! As far as FPSC is concerned, I guess I count as a fossil "
LOL then I guess that makes me star stuff left over from the big bang. You will be missed man. Talents like yours don't come along all the time. Life takes you on all sorts of journeys,maybe one day you'll revisit this one again. When and if you do just know you will be greeted with open arms. Good luck in life and all your future endeavors! Quote: "LOL then I guess that makes me star stuff left over from the big bang." Yes you are! Altough it was more related to the time I used FPSC rather than my age. Quote: "You will be missed man. Talents like yours don't come along all the time. Life takes you on all sorts of journeys,maybe one day you'll revisit this one again. When and if you do just know you will be greeted with open arms. Good luck in life and all your future endeavors! " I wasn't cheking in on skype that much recently either so its partly my fault! I'm on skype every second day now though! I anticipate that we'll run into each other soon! Hey there! Some of my old vids are back online on ma youtube channel! I leave them up there for newbies to take pointers in terms of lightmapping. 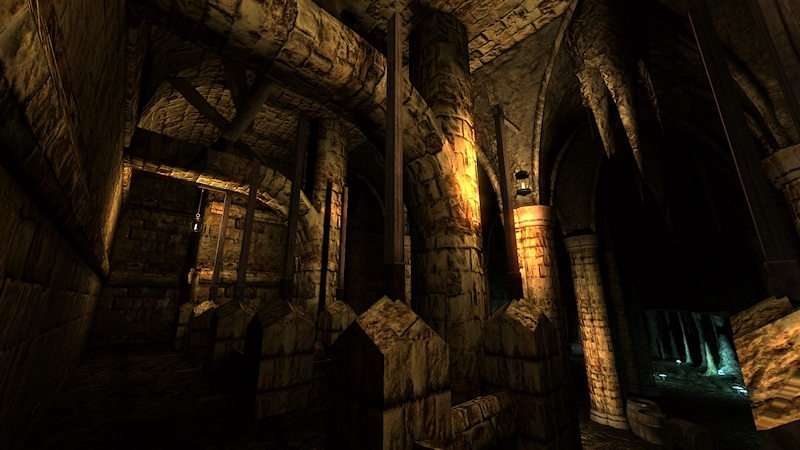 Quote: "I leave them up there for newbies to take pointers in terms of lightmapping. " And I can´t recommend enough to do that! Sad to see you go wolf. you are one of, if not the best level designers i have seen on this forum. I can only imagine what you could accomplish in FPSC-R. Good luck. Thanks man! I'll stick around and make the occasional model though. I'm currently uploading some of my stuff to the reloaded store. BTW: Is this http://www.thegamecreators.com/?m=gallery_view&i=2476&p=0 your work ? Watching the video makes me think it's SPYRA ? No, thats almost a carbon copy of the first level of Spyra. 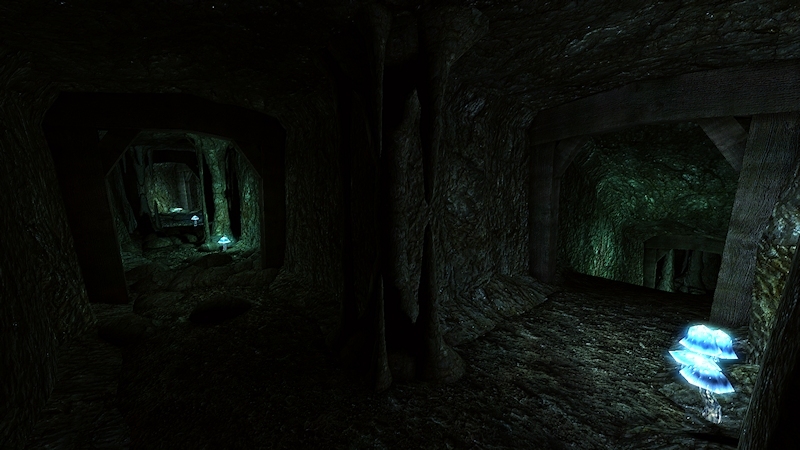 It mixes in some concepts I had in Relikt too (the blue orbs on dungeonpack pillars as lightmapping). Its kind of depressing...if the creator has to copy the layout of my level, which ultimately means he has no inspiration of himself, why bother making games at all? Quote: "No, thats almost a carbon copy of the first level of Spyra. 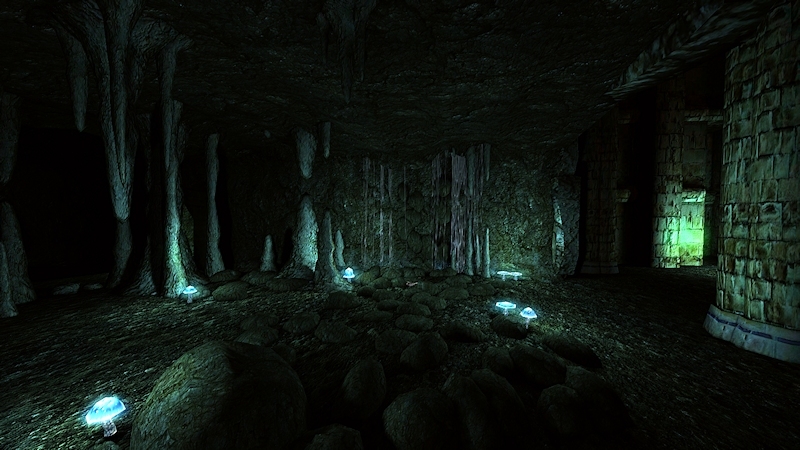 It mixes in some concepts I had in Relikt too (the blue orbs on dungeonpack pillars as lightmapping). Its kind of depressing...if the creator has to copy the layout of my level, which ultimately means he has no inspiration of himself, why bother making games at all?" That was my exact thoughts on that too. I was like... there is no way they ripped off Spyra that hard. I know I'm saying a lot but I feel like there is someone who copied Escape the Bunker up to character names and even certain scare placements. They obviously played my game and decided to one up it? I don't know. I like to avoid copying other FPSC devs. I can't see why people would want to either. Its good to see you back on the forums a bit... even if its not for more of that epic game design skills. Quote: "No, thats almost a carbon copy of the first level of Spyra. It mixes in some concepts I had in Relikt too (the blue orbs on dungeonpack pillars as lightmapping).?" Yeah, the bluntest imitation ever seen in the gallery. Indeed, so blunt that it even cannot be counted as flattery in your direction. Quote: "Its kind of depressing...if the creator has to copy the layout of my level, which ultimately means he has no inspiration of himself, why bother making games at all?" I mean, we are all are glad and thankful for guys like you, rolfy, bond1 and quite a few others here who insist in firing our inspiration by showing us what is possible if one only tries, but that is quite another thing. Quote: "Disappointed that you never finished the weapons for the cyberpunk pack, you are a great artist." Me too! I was just not ready to do anything rigged and shaded well enough to be dynamic back then! Also thanks for the compliment. They look good as renders but wouldn't look good in FPSC... however! I designed a pistol for Reloaded. There will be a thread about it next month. Quote: "I will be watching your store profile"
Thanks! You will get scifi and cyberpunk assets on there very soon aswell. Quote: "I know I'm saying a lot but I feel like there is someone who copied Escape the Bunker up to character names and even certain scare placements." I can see why someone would want to copy escape the bunker, though. It made use of FPSC very efficiently and that is where the biggest challenge lies. This isn't the first time one of my games has been copied. (exhibit A) ...but this guy had the courtesy of naming me in his Moddb Profile AND its in another engine. Quote: " I like to avoid copying other FPSC devs." Me too. One would think this would be a given, especially since there are so many games out there to rip off ...but then again, that would require creativity..and if you're a copycat, you don't have that. All I can say is that I guess this means that we did something right with our games. Quote: "Its good to see you back on the forums a bit... even if its not for more of that epic game design skills." Thank you I might make nice levels, but I must say that you made the better games so far. I will however finish Spyra, if at an even slower pace. Quote: "Yeah, the bluntest imitation ever seen in the gallery. Indeed, so blunt that it even cannot be counted as flattery in your direction." I usually like to see that another user got inspired as my work, but you are right, this is way too far. Quote: "I mean, we are all are glad and thankful for guys like you, rolfy, bond1 and quite a few others here who insist in firing our inspiration by showing us what is possible if one only tries, but that is quite another thing." Thanks! I hope I will continue to do so in the future. You are too generous. I've come to accept my project for what they are, good or not. It's a matter of perception I guess. I just like to sit down and watch people do Let's Plays on my past projects. Sometimes I cringe at how bad my design was in some areas. Sometimes I see people playing that get it right away and I don't feel so bad. Its always a toss up but I appreciate the kind remarks. And it hit me awhile back that Thanatophobia and ETB shared a similar setting. At the time I had not played Thanatophobia yet (shocking... I know) so I hope I didn't look ignorant when I said I don't like copying people. I see you made a new Spyra WIP so I can't wait to go on over and check that post out! Quote: "I see you made a new Spyra WIP"
Quote: "Sometimes I cringe at how bad my design was in some areas. Sometimes I see people playing that get it right away and I don't feel so bad. " Same here! I notice how many people try and do things I never thought of as a developer and I'm always pleasantly surprised how non-jaded and respectful some of these people are. Its refreshing that many truely get its a homecooked indie game and treat it just like that. It motivates me to make games...quite a few people like them. Quote: "And it hit me awhile back that Thanatophobia and ETB shared a similar setting." Nazis, Bunkers and Horror? Many things share that setting, it comes natural and you took a very different route than I did. Quote: "I see you made a new Spyra WIP so I can't wait to go on over and check that post out!"